Fête de la Musique is a worldwide celebration of (live) music that takes place each year on June 21st. 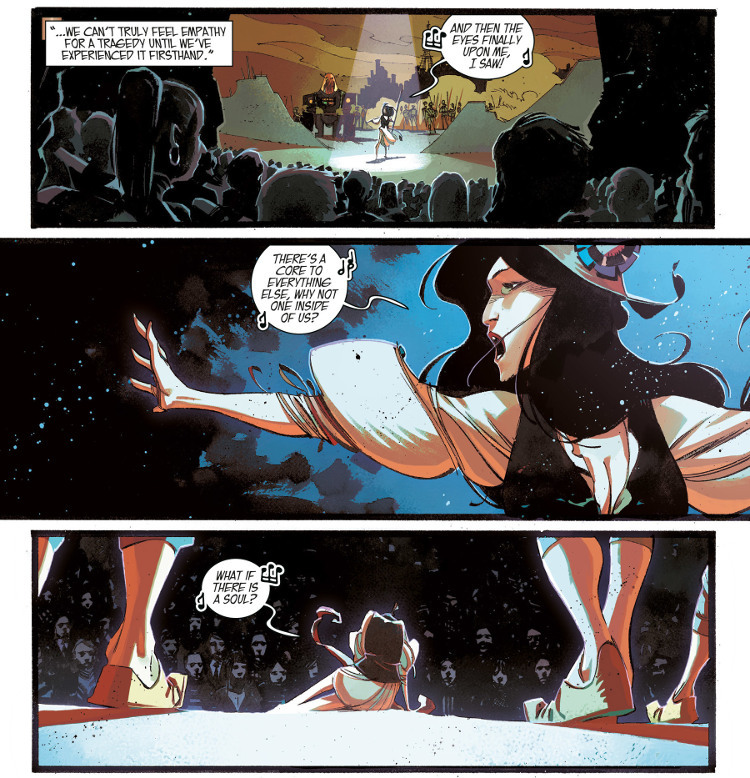 In comics, depictions of music abound, and due to the purely visual nature of the comic medium, comic creators have found a vast variety of ways to represent the auditive medium of music. 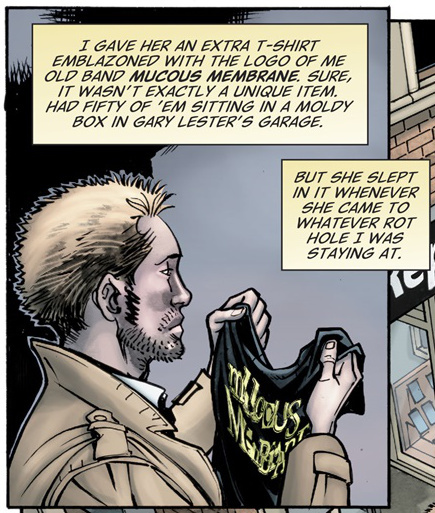 Here are some random examples from current American comic book series. 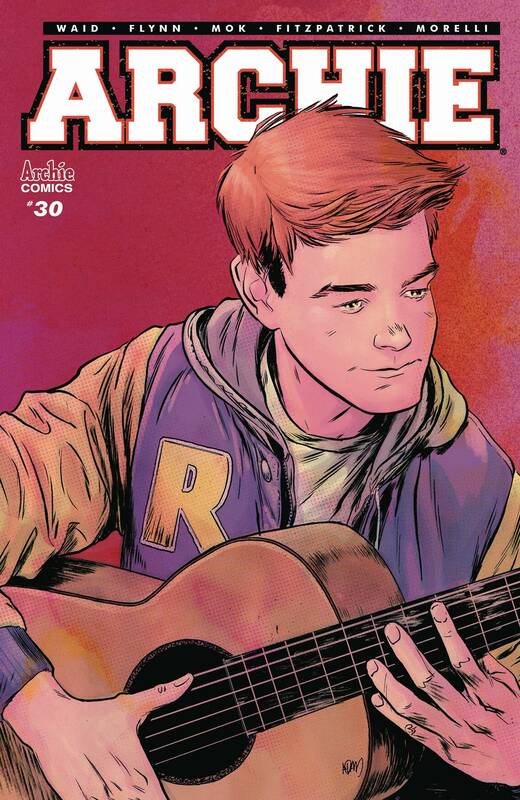 The music: Both the regular cover of #31 and the Adam Gorham variant cover of #30 show Archie Andrews with a guitar, so you can tell already from the outside that music plays a certain role in this comic. 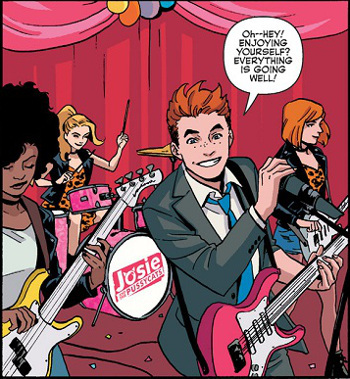 In these two issues, the Spring Dance at Riverdale High is on, and Archie – instead of going there with either Betty or Veronica, his perennial love interests – is supposed to play live music there with a backing band. But for various reasons the band doesn’t show up. A replacement is found just in time with Josie and the Pussycats, a band that has its own Archie Comics title but co-exists in the Archie universe. This must be the first time they appear in the main Archie comic though, as Archie is apparently not familiar with them yet. Despite the frequent occurrence of music in Archie, it’s often depicted unrealistically. The main problem in this particular instance is that Josie and the Pussycats are booked at the last minute, when the event has already begun, but they still seem to perform well with a guitarist and lead singer they have never seen before, let alone rehearsed with. 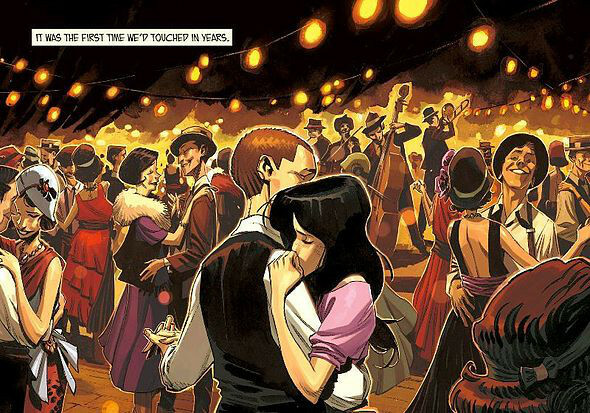 But who knows, maybe “I’ll Never Let You Go”, the song they’re shown performing, is a ubiquitous, easy-to-play standard in the Archie universe, and not the obscure (probably made-up by Waid and Flynn) song it is in the real world. Apart from that, the performing musicians are depicted authentically; even all their instruments are plugged in. The rest: After some artist shake-ups, a competent team with Mok and Fitzpatrick has been found at last who will hopefully stay around for some time. 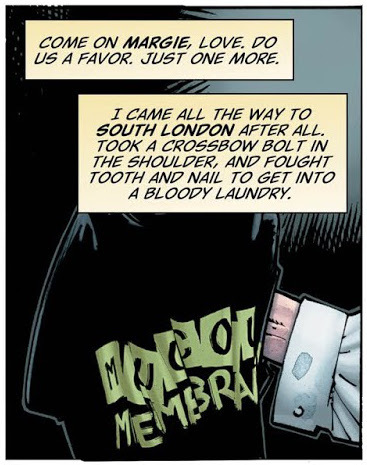 And even in its third year, Waid’s writing is still rock solid. Except for his tendency to take on big issues and then handle them with a certain heavy-handedness (see also Champions or his current Captain America run): recently it was disability (Betty’s car accident and miraculous recovery), now it’s gun-wielding at a high school. It will be interesting to see how Waid and Flynn resolve this. A couple of weeks ago, a headline in a local German newspaper caught my eye: “Manga singer wins The Voice of Germany” (a television talent show similar to Idol(s)/Superstar). What on earth could a “manga singer” be? Maybe someone who writes songs about manga stories? There is one German YouTuber I know of, Daniela Winkler a.k.a. Horrorkissen, who sings not only cover versions of anime theme songs but also her own songs about anime characters, cosplayers, etc. According to one newspaper article I’ve found, she likes to draw manga, and she is pictured drawing something (in a photograph provided by her television channel). Unlike Daniela Winkler, however, I don’t think she has published any manga, and there’s no connection between her manga drawing and her singing. Jamie-Lee Kriewitz said she is a fan of K-pop, i.e. pop music from South Korea. This has very little to do with manga, but some journalists still manage to link together Kriewitz’s music to “animation film pop” to anime to J-pop to her K-pop endorsement. Something all media outlets comment on are her stage outfits, which are apparently inspired by Japanese fashion – particularly Decora style, or Decora Kei. I have to take Kriewitz’s word for it because I can’t tell all the Japanese fashion styles apart, but the funny thing is that her clothes form the basis on which the media draw the connection to manga. 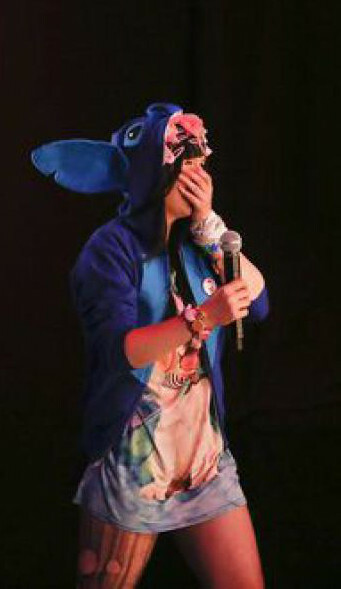 On her first The Voice performance, she wore a hooded sweater modeled after Stitch from Lilo & Stich – i.e. a character from an animated film, not even from a comic – and this seems to have triggered an amalgamation of “Japan” and “animation” into “manga” in some people’s heads. This idea was further cemented at the Voice of Germany season final on which one of the coaches wore a Dragon Ball outfit as an allusion to Kriewitz’s style. She also said she cosplays at conventions, but her stage outfits aren’t strictly speaking cosplay in the sense that she portrayed a particular character (let alone a manga character). So Jamie-Lee Kriewitz’s “manga singer” denomination stands on shaky ground, to say the least. But I bet we’ll hear a lot more of that sort when she competes in the German preliminaries for the Eurovision Song Contest on February 25. Something slightly off-topic for the end of the year: this is a translation of a post originally published in German at Perlen der Popgeschichte on December 18. The historical scholarly disciplines often shy away from judging the immediate past. In contrast to journalism: usually already in December, a lot of magazines publish year-end reviews, e.g. the current issue of Musikexpress (cover-dated January 2014, published on December 12, 2013: “Das war 2013” [“this was 2013”]). Apart from a 29-page chronology and a 12-page list of the “50 records of the year”, it also contains, albeit only on one page, “the songs of the year”. Which one was the song of the year, actually? In comparison to the previous year, which brought us two all-time hits with “Somebody That I Used to Know” and “Call Me Maybe” (both of which already came out in 2011, but didn’t achieve worldwide fame until 2012), 2013 gives a less clear picture. Possible candidates are, among others, “Thrift Shop” by a rapper named Macklemore (single of the year according to Billboard), “Blurred Lines” by a Robin Thicke (“bestselling single of the year” according to Musikexpress) and “Do I Wanna Know?” by the apparently still existing Arctic Monkeys (ranked 1st in the aforementioned Musikexpress charts). A lot could be said about those songs and their reception, but there is another song that is maybe still a little bit more entitled to the title “song of the year 2013”: “Get Lucky” by Daft Punk feat. Pharell Williams. “There is no question that Daft Punk have penned the summer hit of the year 2013” (my translation), says Musikexpress and ranks “Get Lucky” 2nd in its year-end charts, after all. For some, that song is timeless, for others (i.e. me) it’s quite an old-fashioned disco funk tune, which nevertheless has somehow proven to be catchy. Perhaps that’s a sign of the times in which errors in taste from the 70s and 80s have almost become acceptable again. 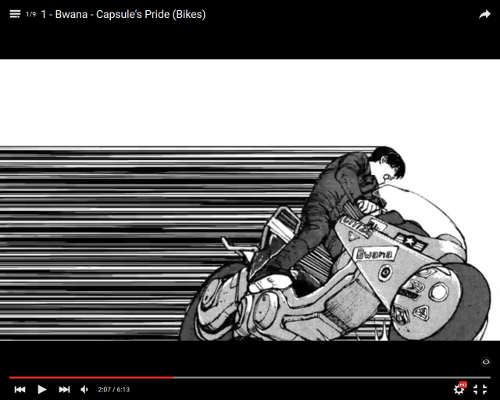 More interesting than the song itself appears to be the accompanying music video. Or is there an official “Get Lucky” video at all? A legitimate question in times of alternative distribution methods. On the one hand, there’s the advertisement clip shown at the Coachella festival for the album Random Access Memories, in which we see, among other things, the two Daft Punk musicians with guest guitarist Nile Rodgers and guest vocalist Pharell Williams, seemingly performing “Get Lucky”. However, this clip only covers 1:40 of the 4 minutes of the song. On the other hand, a 47-second preview for the video of the official remix was published on the YouTube channel of the record label. It shows a crowd dancing in the moonlight and, again, the Daft Punk robots. This means there were several video shootings in the context of “Get Lucky”, although they weren’t used for a regular video clip. I think such a video clip exists indeed, albeit not always recognised as such and instead referred to as “pseudo video” or even only as “Audio”. Even though this video is a stroke of genius. Similar to a record cover (indeed similar to the cover of the “Get Lucky” single), the silhouettes of the four musicians are set against the evening sun in this video, motionless. (Whether that is actually a reference to George Lucas’s directing debut THX 1138 or not, the similarity can’t be denied.) Only in the second half of the song, at the beginning of the vocoder break, subtle movement is brought into the image, by means of which it can now be clearly identified as a video and not as a still image. Then the figures freeze again, and with this static image (which now exactly matches the single cover) the clip ends. The ingenuity of this video clip is that it imitates other timely manners of visual accompaniment of music through the appearance of a still image: the displaying of record covers in MP3 player software or streaming services, as well as the usage of static images with audio files illegally uploaded on YouTube. Furthermore, the video runs counter to the notoriously short average attention span of the internet audience, as nothing “happens” in it for two minutes. Thus the “Get Lucky” video plays wittily with the recipients’ expectations – and may well be the music video of the year. At the same time, the question arises how valid the traditional 1:1 relation between single and video clip still is these days.